“My father (François Pinault) and I have decided to release as of now from the funds of Artemis a sum of 100 million euros to participate in the effort that will be necessary for the complete reconstruction of Notre Dame,” Pinault wrote in a statement, which probably sounds a little less odd when it’s not translated by Google. While Notre Dame did suffer extreme damage, predictions that it would burn completely to the ground proved untrue. And luckily, several religious statues had been removed as part of a nearly $7 million restoration effort, in addition to other artifacts that were safely recovered, Paris Mayor Anne Hidalgo said on Twitter. 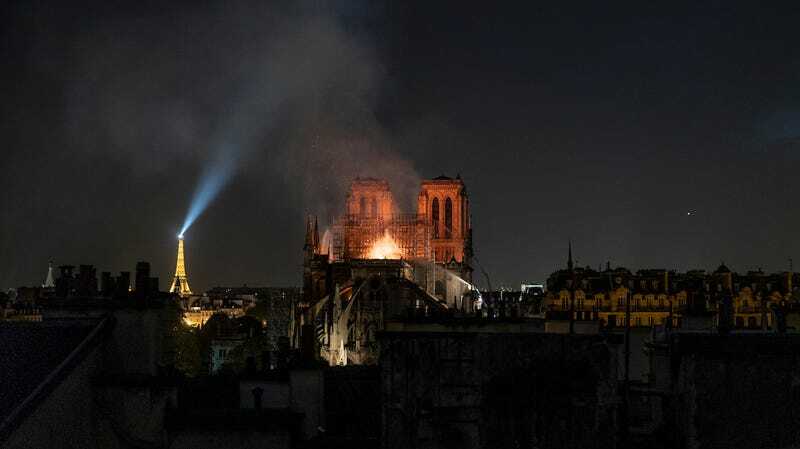 “Thanks to the @PompiersParis, the police and the municipal agents, the Crown of Thorns, the Tunic of Saint Louis and several other major works are now in a safe place,” she wrote. The cathedral’s facade and two bell towers were also rescued. The fire reportedly started in connection with renovation work, and as of now is thought to have been accidental.